Place the pistachios, cranberries, garlic and parsley into a food processor and process until very finely chopped. While the food processor is running, slowly drizzle in 2 tablespoons of the olive oil. Spoon out the pesto into a bowl and stir in remaining olive oil. Season with salt and black pepper to taste. The pesto should be slightly sweet and salty. 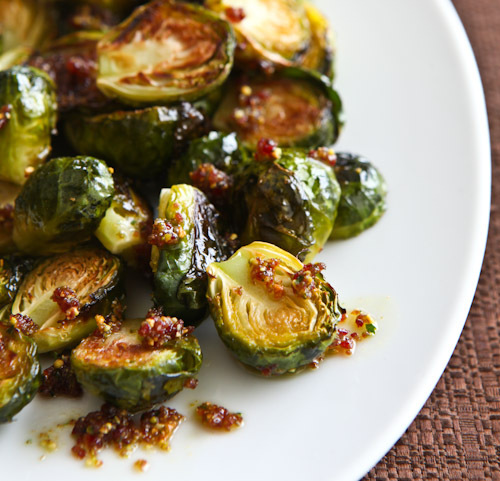 Serve with goat cheese, chicken, salad, fish, scallops or on vegetables, such as Roasted Brussels Sprouts. Cut off the knobby end of the brussels sprouts and pull off any loose outer leaves. Cut the brussels sprouts in half, lengthwise. On a baking sheet, spread the brussels sprouts evenly and roast for 25 minutes, until you begin to see a bit of browning on the brussels sprouts. The interior should be fork tender. Season the brussels sprouts with salt and pepper and spoon the Cranberry Pistachio Pesto on top.